Every tech gadget must be judged solely on what it provides, its purpose in life, and whether it will help you accomplish tasks and enjoy your media. With the Motorola Xoom, it's too easy to make constant iPad (and iPad 2) comparisons. Can you purchase movies as easily? Does the screen get as grimy? Does it cost more? Yet, the Xoom is the first Android 3.0 tablet, the first really powerful tablet with a dual-core processor, and a sleek, 10.1-inch slate that is easy on the eyes. There's no question the Xoom is a brilliant tablet, one that is incredibly flexible in terms of media you can put on the device. With a 5-megapixel front camera and a 2-megapixel rear-facing camera, 32GB of local storage (plus a potential for more SD storage after the next software update), 1GB of RAM, 4G support once the LTE roll-out starts and after a software upgrade, and 10-hours of battery life, the Xoom has the hardware specifications to make you sit up and take notice. Plus, the new Android 3.0 tablet interface lives and breathes in the open source world. Frankly, the Motorola Xoom blows the Samsung Galaxy Tab out of the water, and that is saying something. We'll keep our iPad comparisons to a minimum (hey, if you wanted one of those you would have bought one by now, right?) and ratchet down our comparisons to the iPad 2 which ships in the UK on 25 March. 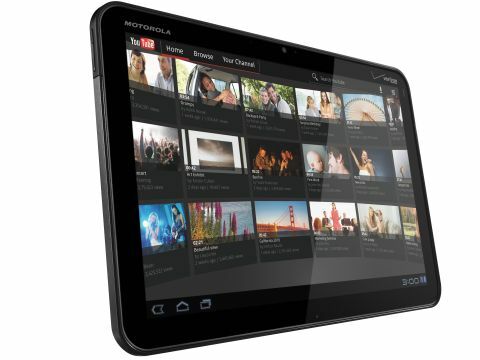 The Xoom is the best Android tablet around and a device that is well worth serious consideration. However, before we go any further, we need to address pricing - the Motorola Xoom is currently available for pre-order for £499. The 3G version is set to cost £100 more at £599. The next-best Android tablet, the Samsung Galaxy Tab, costs £399.00 without a contract, which is quite a bit lower than the Xoom. And, the Apple iPad 2 will start at £429.00 for the Wi-Fi-only version, so the Xoom is expensive. Yet, our overall impression testing the device is that it is a notable upgrade from every other Android model, including the Dell Streak series. The heart and soul of this tablet is the new Android 3.0 (Honeycomb) OS, which ran lightning fast in our tests on the Nvidia Tegra 2 dual-core processor. And we mean fast: finger swipes registered quickly and accurately, and the few games available ran smoothly. Android 3.0 is a brilliant interface for tablets – much more flexible than iOS in that you can drop widgets all over your homescreens, and more responsive and even better suited for reading books and playing games. The Xoom even touts this fact in the Google Books app: there's a cool page flipping animation. The Xoom has a decidedly PC-like UI in that you can press a button to see all open apps (unfortunately, you can't selectively close them from here but you can close apps through a memory manager under the settings screen), click the clock to see notifications and access settings, and move objects around the screen easier.